Intertwined and its accompanying catalog will provide an international look at contemporary basket making and its current level of innovation and experimentation. The baskets in their collection utilize a range of materials and techniques from traditional organic to commercial and often surprising media. Represented artists include the well-known international to the regional—four from Santa Fe—and they work in both functional containers as well as closed, sculptural forms. Intertwined will include more than 70 traditional and non-traditional baskets, including works by some of the major figures in contemporary basket making: Ed Rossbach, Katherine Westphal, Sally Black, Kiyomi Iwata, Kazuaki Honma, Dorothy Gill Barnes, Carol Eckert John McQueen, Elsie Holiday, Ferne Jacobs, Norma Minkowitz, Fran Reed, Lisa Telford, John Garrett, Kay Kahn, and many more. Both Garrett and Kahn are New Mexico artists. The contemporary baskets of Intertwined are another sub-category of “crafts” that the Museum has been showing in recent years, including this summer’s exhibition Flux: Reflections on Contemporary Glass and several exhibitions on ceramics over the past decade. Intertwined is curated by Heather Sealy Lineberry, Senior Curator, ASU Art Museum. 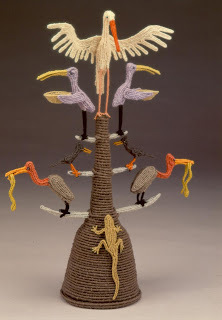 Jane Sauer, nationally known basket maker and scholar, consulted on the selection process. The 48-page color catalog includes an essay by nationally-known curator and scholar Kenneth R. Trapp, and a short piece by artist Ferne Jacobs. Intertwined: Contemporary Baskets from the Sara and David Lieberman Collection is organized by the Arizona State University Art, Tempe, Arizona.